What Is Volcanic Ash Made Of? Volcanic activity has been much in the news lately since an erupting volcano in Iceland wreaked havoc with European air transport last month (April 2010). 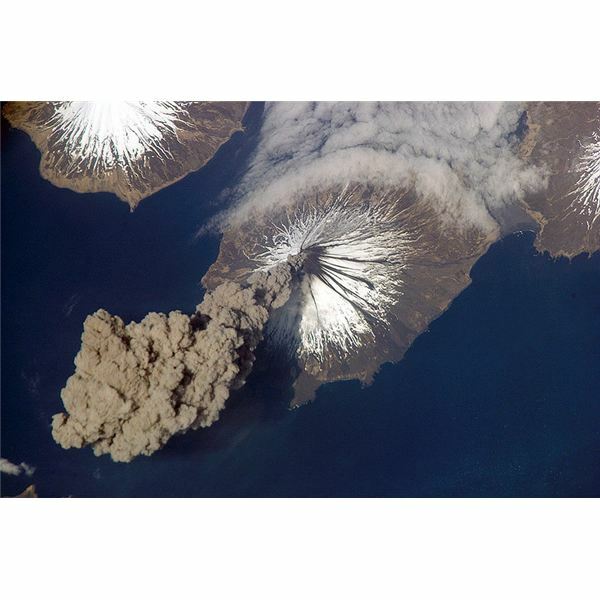 The problem that grounded much of the air traffic over the northern region of Western Europe was the ash cloud being released by the Eyjafjallajökul volcano. The eruption started on the 15th of April 2010 at 06:00 and by 20:00 that day, the ash cloud had reached Southern Denmark. Ash from the volcano was estimated to reach up to an altitude of 18,000 feet (approximately 5.4 km) and was carried over much of Europe by the prevailing weather system. A modern jet airliner cruises at an altitude of 12,000 metres, consequently jets flying through contaminated airspace would need to fly through the ash cloud when attaining their cruising altitude and when descending to land. Much of European airspace was closed as a precautionary measure when the eruption was at its most intense and the weather system was blowing ash over Europe. The reason for this was that, in 1982, a British Airways jet en route for Aukland flew through an ash cloud produced by the eruption of Mount Galunggung on Java and all four of its engines stalled. Fortunately, the pilots managed to put the plane into a glide and restart the engines. The flight had to make an emergency landing in Jakarta, but nobody was hurt. But exactly what is volcanic ash made of and why is it so dangerous to air traffic? Volcanic ash and debris are known as tephra. Small, irregular shaped fragments of rocks, minerals and volcanic glasses are what volcanic ash is made of. The range of particle sizes associated with an eruption is very wide from large boulders to tiny fragments of volcanic glasses as small as 0.001 mm in diameter. Volcanic ash itself is inorganic in nature and insoluble in water. Ash particles are highly abrasive and can conduct an electric current when wet. Due to the very small particle size and the heat of an eruption, ash particles can be lifted high into the atmosphere and may travel many thousands of kilometres from their source before falling back to earth. Ash is transported by high altitude winds. The glass fragments found in ash are due to gas bubbles being released into the magma of the eruption as it wells up from deep underground. As the magma cools and solidifies, these gas bubbles are trapped. During the eruption process, the gas inside these particles becomes heated to the point where solidified mass explodes, creating glass shards. If the magma comes into contact with water during the eruption (a phreatomagmatic eruption), a violent explosive reaction will occur. This produces ash fragments with angular shapes which are particularly abrasive (therefore more dangerous to aviation). The eruption of Eyjafjallajökul took place through a glaciated ice sheet and therefore was a phreatomagmatic eruption. Whilst volcanic ash itself is insoluble, during its formation, ash particles can absorb soluble material onto their surfaces. This happens when the ash particles interact with gases contained within the magma (sulphur and halide compounds) and means that the ash particles become corrosive due to the formation of sulphuric and hydrochloric acid on their surfaces when they become hydrated. This explains why acid rain is encountered during an eruption. So, why are ash clouds and aviation so incompatible? The answer to this question relates to the physico-chemical properties of volcanic ash and just what volcanic ash is made of. As we have seen, ash may be acidic and so can cause chemical corrosion to parts of an aircraft. However, the major problem is that ash particles will melt at the temperatures they encounter when sucked into a jet engine. The molten material may choke the cooling vents on the turbo fans leading to engine failure. Since ash plumes cannot be detected on an aircraft’s radar, the prudent course of action is to close airspace where there is a significant probability of an aircraft encountering a volcanic ash plume. Fortunately, ash plumes can be detected by satellites, so aviation can be protected from the dangers of flying through them. A volcanic eruption can send ash into the stratosphere where it can cause climatic change by altering the amount of solar radiation reaching earth’s surface. Ash clouds contain glass fragments formed by the explosive eruption of magma during an eruption.